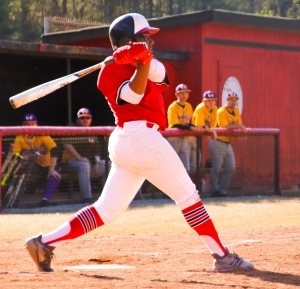 Region 4-4A baseball foes Druid Hills and Hampton combined for 22 strikeouts and allowed just two hits with Hampton coming out on top 4-1 at Druid Hills John Devore Field on Wednesday afternoon. The two teams were tied 1-1 heading into the top of the third inning when Hampton would take the lead for good with a pair of runs aided by a fielding error by the Red Devils. A one-out double by Amiel Hill got the inning going for Hampton. Hill came around to score as Logan Seehafer reached on an error and moved to second to put the Hornets up 2-1. Seehafer would come around to score on a double steal with two out to give the Hornets a 3-1 advantage as the inning ended on a strikeout as Druid Hills’ Augie McQuaig got out of the inning. Neither team managed to score in the fourth inning despite the Red Devils getting two runners on with two out before Seehafer would pickup strikeout number 13 as he finished the inning by striking out the side. Hampton extended its lead to 4-1 as Brett Campbell was hit by a pitch, stole second and came around to score as a throw to third on his steal went into the outfield. Seehafer set the Red Devils down in order in the bottom of the fifth. Both teams got a runner on in the sixth, but both pitchers would finish their outings without allowing another run. Joseph Weingartner came on in relief of McQuaig in the top seventh retired the first two batters before giving up a walk before enticing a groundout to get the Red Devils up to bat still trailing by just three. Brett Campbell came on in relief of Seehafer in the bottom of the seventh and gave up a walk to Terrence Sales to start the inning and the Red Devils were threating two batters later with two runners on base. Sales was caught in a run-down and Campbell was able to get a groundout to second to end the game. Hampton had scored the first run of the game as two errors allowed Seehafer to put the first run of the game on board in the opening frame. Druid Hills answered in the bottom of the second inning as David McQuaig reached on a wild pitch on a strikeout. Zach Hailey’s single to left put McQuaig on third and a couple of pitches later he beat the play at the plate following another wild pitch to knot the game at 1-1 heading into the third inning. Augie McQuaig took the loss despite allowing no earned runs, striking out seven and walking four in six innings on the mound for Druid Hills (8-8, 3-3). Seehafer finished his day with six innings of work as well with 16 strikeouts, 1 walk and one hit batsman to pick up the win. 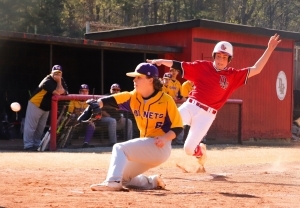 Hailey had the only hit for the Red Devils, his single in the second inning, and Hill’s third inning double was the only hit for the Hornets (7-9, 5-1).